Barcelona and Shakhtar Donetsk became the first teams to reach the Champions League quarter-finals with contrasting wins over Arsenal and AS Roma, who both finished with 10 men, on Tuesday. 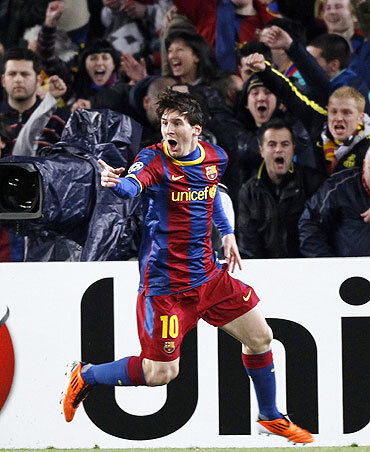 Barcelona, favourites to lift the European Cup at Wembley in May, overcame a 2-1 first-leg deficit to beat Arsenal 3-1 at the Nou Camp for a nerve-wracking 4-3 aggregate win, while Shakhtar followed up their 3-2 first-leg win in Rome with a 3-0 victory and 6-2 aggregate triumph. Barca's win was overshadowed by the controversial dismissal of Arsenal's Robin van Persie, who was shown a second yellow card by Swiss referee Massimo Busacca for striking the ball at goal after the whistle blew for offside in the 56th minute. Arsenal manager Arsene Wenger was incensed by the decision saying it cost his team the match, while the Dutch striker described his dismissal as "a total joke". "I am convinced if it had stayed 11 against 11 we could have won this tie tonight. It's very hard to accept," said Wenger, who had a furious exchange with the referee after the final whistle. Van Persie told Sky Sports: "My sending off was a total joke. How can I hear his whistle with 95,000 people jumping up -- how can I hear that for God's sake. Please explain that." Despite Wenger's protestations, Barca had 19 attempts on goal compared to none from Arsenal who scored with an own goal off the head of Sergio Busquets after 53 minutes. Barcelona dominated the first half and took the lead through Lionel Messi in stoppage time before Busquets's mistake at an Arsenal corner put the visitors ahead on aggregate eight minutes into the second half. Van Persie was then sent off before Xavi (69th) and Messi, with an audacious penalty two minutes later after Laurent Koscielny fouled Pedro, gave Barca a 3-1 win as they knocked out Arsenal for the second successive season. In Donetsk, Shakhtar stretched their aggregate lead to 4-2 against Roma when Tomas Hubschman flicked in after 18 minutes and further goals from Willian, who picked his spot following a corner in the 58th minute, and Eduardo, with a fine individual effort after 87, sealed their place in the last eight. Roma's Philippe Mexes made his team's tough task that much harder with his 41st-minute dismissal for a second yellow card and Marco Borriello missed a 28th-minute penalty for Roma. Shakhtar became the first team from Ukraine to reach the last eight of the competition since Dynamo Kiev reached the semi-finals in 1999 and they maintained their record of never having lost at their Donbass Arena since moving there in 2009.